I love when I run across bits of history that show me how similar we are to the people who lived two hundred years ago. Today, I’m writing about a select group of individuals that many of you may know. They are the husbands, boyfriends, and fathers of women who shop. You can easily spot them, sprawled out on the chairs and sofas in clothing stores. They are the ones looking thoroughly bored or completely engrossed with their phones. Some might even be asleep. I have a soft spot for these men, who think enough of the women in their lives to patiently endure such torture. 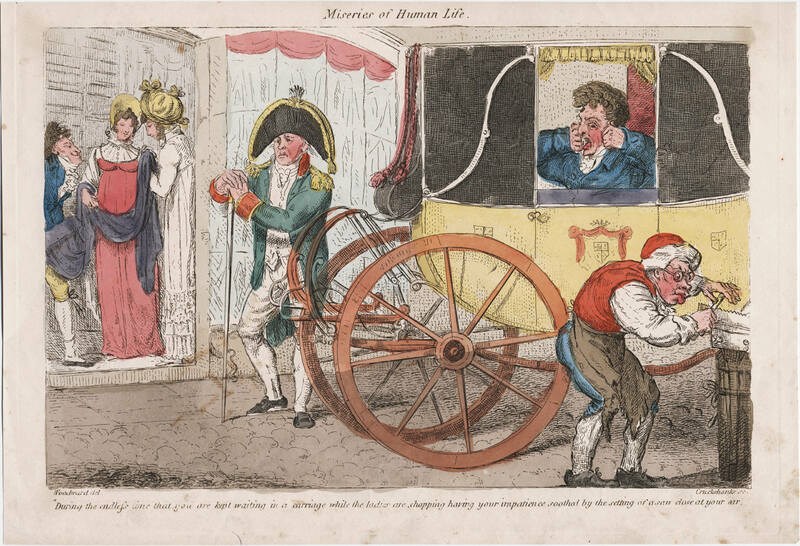 While I’m accustomed to seeing these poor souls in the stores I frequent, I was surprised to run across such men in a caricature that was printed in 1808. The etching, entitled Miseries of Human Life, is by Isaac Cruikshank and was printed in England. It illustrates the trials endured by husbands while they waited for their wives to finish shopping. During the endless time that you are kept waiting in a carriage while the ladies are shopping having your impatience soothed by the setting of a saw close to your ear. So Regency era gentlemen had to endure the sound of the saw, and today’s gentlemen must contend with the music blaring in some of the shops they sit in. I suppose it’s true, the more things change, the more they stay the same. *This post is dedicated to all the men who patiently sit in shops and wait for the women in their lives. Stay strong, my friends. Ha ha. Love it, Laurie! Thanks, Colleen! I’m glad it made you laugh. Thanks for the Sunday chuckle. poor men and their tolerance for shopping. Glad you got a giggle, Mia!